WizzAppChecker is a useless application that claims to notify you “when a suspisuos application was downloaded or created on your computer”; however, the creators of this very simplistic website (wizzappchecker.wizzproducts.com/index.html) must have rushed to fill the poor content and left “suspicious” typos on the page. This is quite unprofessional and makes you wonder about the reliability of the product they are so eager to promote. As a matter of fact, we have found that this is just another ad-supported application by Wizzlabs who is also responsible for other similar adware programs, including WizzWifiHotspot. Since this application has proved to be unreliable after careful testing and also potentially risky to system security by displaying third-party ads, we believe that you would be better off without it. If you want to keep your computer clean, we recommend that you delete WizzAppChecker immediately. But it is also possible that this is not even the only malware threat you need to face in your endeavor to restore security. There are mainly two channels for this adware through which it can appear on your computer. It is possible that somehow you end up on its official website and download it. However, we doubt that a lot of computer users would land on this site. The base for our doubt is that if you get the name of this application from somewhere and you want to download it, you would most probably run it in Google to find a website where it is available, preferably an official one. However, your search may come back with some worrisome results. In other words, most articles on the first search results page could be mainly about how you should remove WizzAppChecker as an adware program. This would surely keep you from wanting to download it or look for its official site; or at least it should if you are a security-minded user. We have discovered that there is an alternative route for this adware, which follows the footsteps of its predecessors. It is possible that you download this program in a freeware bundle. Unfortunately, this bundle could contain more malware threats that you can single-handedly tackle. It is possible to find potentially unwanted programs, browser hijackers, Trojans, and adware programs in such a malicious package. The installers of such bundles can also be quite tricky to make sure that you overlook certain vital bits of information, such as checkboxes assigned to particular components of the package that could give you an opportunity to opt out. A lot of users actually infect their own machines because of skipping this step during the installation of bundles. But when you end up with a number of malware threats, you should not simply delete WizzAppChecker alone. It is also vital that you take care of all other potentially risky applications as well. Otherwise, your PC just will not be secure. You can choose to use a free online tool to scan your system for malware threats; just make sure that you use a reliable one because the web is swarming with rogue security tools and rip-offs as well. “Protect your computer from malware and get our warning notifications” is all you can find about this application on its website when you check out the “Features” page. While we were testing this tool, we found that it mainly detects system executables (.exe files) and pops up its annoying messages. You are offered three options whenever it claims to find a suspicious file: you can “Analyze,” “Delete,” and “Ignore.” We do not think that you can actually consider these detections reliable. But as its EULA reveals, this application may be used to show you third-party ads as well. Unfortunately, these ads cannot always be trusted. It is possible that your click on such a commercial may take you to a malicious website. Most users do not consider advertisements harmful. But you should know that you can never be sure whether you end up on a trustworthy and legitimate website if you click on one. If there is an adware program on your PC, it is also possible that is spies on you or hijacks legitimate third-party advertisements on otherwise reputable websites. Therefore, you need to be careful with this software as well. 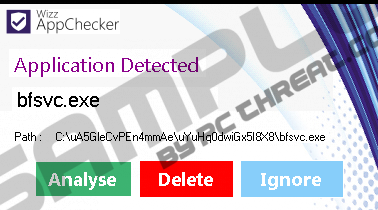 We suggest that you remove WizzAppChecker from your computer right now. Finally, we can offer you some good news: It is quite simple to eliminate this annoying adware program. All you need to do is locate its uninstaller through Control Panel and use it. Please follow our instructions if you need assistance with this. It is possible that you are fed up with the constant malware intruders and would like to have peace of mind. In that case, we recommend that you consider installing a powerful malware removal tool that will safeguard your PC from all known malware infections. Access the Start menu and go to Control Panel. Press Win+R and type in Control Panel. Hit OK.
Press Win+Q and type in Uninstall a program. Press OK.
Quick & tested solution for WizzAppChecker removal.